There is no suffering comparable to the tragedy created by an earthquake. In Haiti, there was the lady who sat on her bed in the hospital and just stared straight ahead for days. She had a broken leg, but that would not account for that look of despair on her face. As we made rounds on the patients, I asked the nurse for the lady’s story. “Her husband died. As well as her four children,” was the reply. I remembered 1 Corinthians 13:13 – “faith, hope, love … but the greatest of these is love.” I know that love is the greatest, but at times, when hope is lost, it can be the most terrible time in one’s life. I was reminded of that as we walked through the streets near the epicenter of the recent 7.8-magnitude earthquake in Ecuador. Buildings were toppled. Automobiles were crushed. There was one particular building we stopped and looked at more carefully because there was a certain stench just in that area. The smell of death.  I remembered it in Haiti and Nepal where Samaritan’s Purse had responded to earthquakes. And now, I could smell it again. 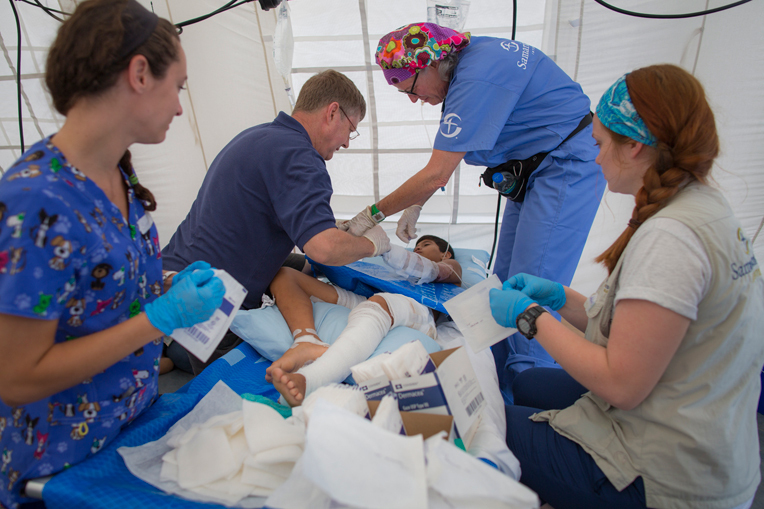 Doctors at work in the Samaritan’s Purse emergency field hospital in Ecuador. They were pulling rubble away from one end of the building which had not completely collapsed. The reality of human life once being in that building before it was demolished became more evident as I saw a man’s shoe lying in the fragments of the toppled wall. But what caught my attention even more than the building, or the stench, or the shoe was a young girl, sitting on a wall, propped up against a side of a still standing building across the street. I got our interpreter to come with me to ask her if she needed help. She just shook her head and stared ahead. 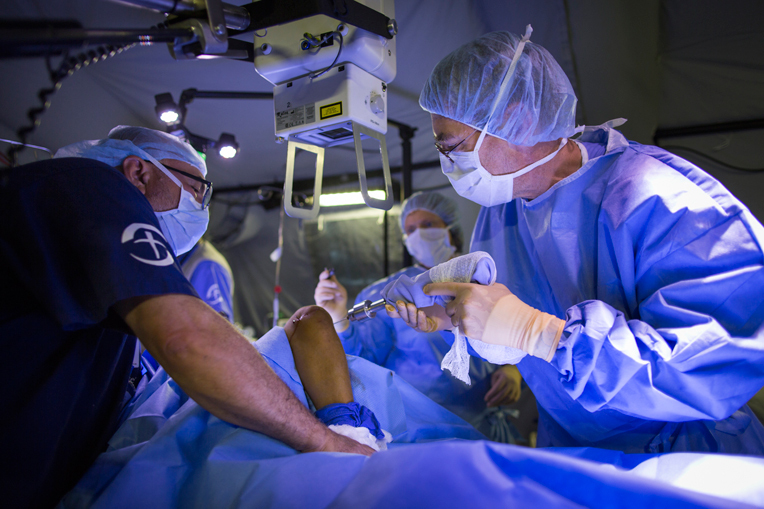 Dozens of surgeries have been performed in recent days at our field hospital in Ecuador. One of the observers began telling us what was going on. The men up on the rubble pile adjacent to the remains of the cracked standing building, were trying to remove enough rubble to see if they could find any sign of life down below. They were part of a search and rescue team looking for the possibility of buried life. Hours ago, the dogs had begun barking as they walked across the top of the rubble. We were told the rescue team had some type of machine that could detect heart beats, and they thought they had picked up three separate heart beats buried below. They had brought an ambulance to the scene but we asked the doctor in charge where they would take the injured. There was no working hospital that had a respirator or an operating room or the needed equipment to care for such injuries. Most likely broken legs, arms, and ribs. Only a clinic. 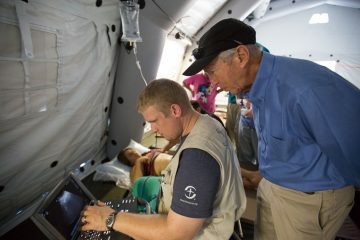 The doctor became excited when we informed him of our field hospital with operating tables and anesthesia and oxygen. Specific instructions were given as to the exact location. Samaritan’s Purse staff bring hope and comfort to patients in earthquake-affected areas of Ecuador. We watched them work for about 90 minutes and then, all of a sudden, one of the team members waved his arms and yelled for everyone to get quiet. Evidently, they were at a point where someone thought they heard something in the rubble. Maybe breathing, maybe a groan or a cough. All that ran through my mind. Within moments, not a sound was made. The whole crowd stood silently awaiting. We watched and waited and prayed. But then a sensation I will never forget occurred. It was a soft smooth movement at first, like trying to stand on sloping ice. Then, in a moment, the ground began a strong pulsating shake as everyone began running and screaming. I glanced up at the teams up on the rubble as they also began scrambling down the slabs of concrete and pieces of the fallen building. About 100 yards away, we all gathered. Was all hope gone? Would they go back and look, risking their lives after such a recent event? We waited. They didn’t go back but neither did they leave. Finally we told the doctor in charge of the ambulance that we were going to the field hospital and if anyone were found, we would be ready to care for them no matter what time of day or night. He thanked us again. We were his only hope. Our medical team members treat the hurting in Jesus’ Name. 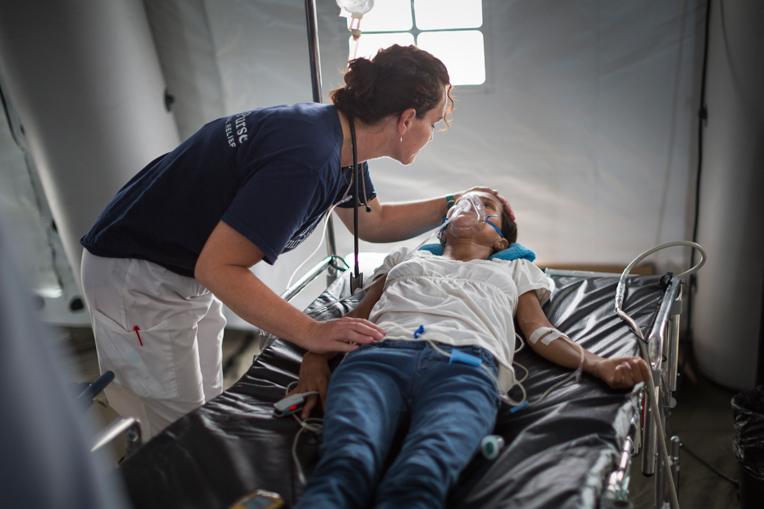 No other organisation has such a field hospital in Ecuador. 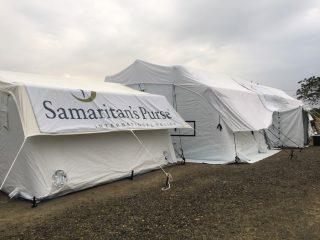 Samaritan’s Purse is their only hope for such care for the sick and injured. When we leave, the hospital will stay because that will be the only hospital they will have for months or years to come. Our doctors and nurses are hard at work in Ecuador following a major earthquake and its aftershocks. 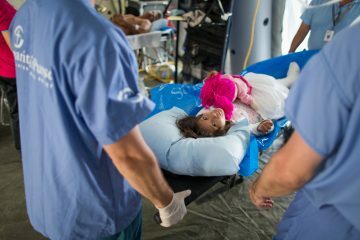 The main theme Samaritan’s Purse has with its medical outreach is that we are interested in the injured’s physical health but even more so in their spiritual health. Faith, hope and love. The greatest is love, but the Lord uses Samaritan’s Purse to give hope to victims of disasters as we have seen in Ecuador.